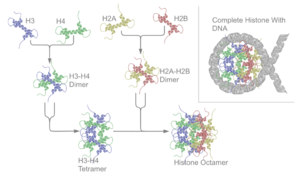 Schematic representation o the assembly o the core histones intae the nucleosome. In biology, histones are heichly alkaline proteins foond in eukaryotic cell nuclei that package an order the DNA into structural units cried nucleosomes. Thay are the chief protein components o chromatin, actin as spuils aroond which DNA winds, an playin a role in gene regulation. Withoot histones, the unwoond DNA in chromosomes would be very lang (a lenth tae width ratio o mair nor 10 million tae 1 in human DNA). For example, each human diploid cell (conteenin 23 pairs o chromosomes) haes aboot 1.8 meters o DNA, but woond on the histones it haes aboot 90 micrometers (0.09 mm) o chromatin, which, when duplicatit an condensed during mitosis, result in about 120 micrometers o chromosomes. ↑ Youngson RM (2006). Collins Dictionary of Human Biology. Glasgow: HarperCollins. ISBN 0-00-722134-7. ↑ Cox M, Nelson DR, Lehninger AL (2005). Lehninger Principles of Biochemistry. San Francisco: W.H. Freeman. ISBN 0-7167-4339-6. ↑ Redon C, Pilch D, Rogakou E, Sedelnikova O, Newrock K, Bonner W (Apr 2002). "Histone H2A variants H2AX and H2AZ". Current Opinion in Genetics & Development. 12 (2): 162–9. doi:10.1016/S0959-437X(02)00282-4. PMID 11893489. This page wis last eeditit on 16 Mairch 2017, at 16:44.